Definition at line 22 of file CLGlobalStyle.h. 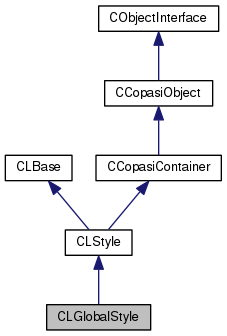 Definition at line 23 of file CLGlobalStyle.cpp. References CKeyFactory::add(), CCopasiRootContainer::getKeyFactory(), and CLStyle::mKey. Definition at line 31 of file CLGlobalStyle.cpp. Definition at line 40 of file CLGlobalStyle.cpp. Definition at line 49 of file CLGlobalStyle.cpp.